Top 10 Indian bestselling business books of 2011! A list of the top 10 bestselling books of 2011 in India would typically include the well known names of Chetan Bhagat, Amish and their likes. But a list of bestselling books in the business category is rare. Let’s take a look at the Top 10 business bestselling books in India in 2011, with a few picks from the Business Standard list of the same title. A famous sports commentator (who is himself an IIM-A grad) and his IIM-A grad wife join forces to write a book about how businesses can take valuable lessons from sports about winning, loosing, combating and rising above from failure. Interestingly this book also marks 300 training workshops for ‘The Winning Way’ that the Bhogle couple have led. The last few years have regenerated an interest in ‘Arthashastra’ written by the great mathematician, administrator and statesman Chanakya. R Pillai has presented his version of the simplification of the sutras, mantras and trade secrets that Chanakya has explained in his original epic. More like a corporate guide, Pillai’s simplified version gives tips on management, leadership and training. Here’s one more IIM-A grad who has jumped on the bandwagon of penning experiences based on his 25 year corporate career in which he sold everything from soaps to diapers. ‘The Habit of Winning’ is a mix about inspirational stories and real life incidents. From the Cola Wars to Michelle Obama’s brand management, these stories aim to inspire you to be a winner in everyday life. It’s amazing to read a book written by a man who has maneuvered his way through an organization for almost 40 years. From the days of Y2K when TCS expanded its client base to the IPO of TCS in 2004 to the potential merger with Tata Burroughs to the large scale recruitments drives that TCS is now undertaking, Ramadorai narrates a great journey that you ought to be a part of. An MBA graduate from IIM-A herself, Ms. Bansal has already authored two bestselling books on entrepreneurship previously. While her first book talked about MBA graduates who jumped on the entrepreneurship bandwagon, her second book talks about non MBA graduates, her recently launched book ‘I Have a Dream’ talks about 20 idealists who become the change they want to see in the world. This book makes for an amazing read because it collects the success stories of 65 varied and interesting people – from famous people like Azim Premji and Mother Teresa to a common realtor, a CA, an attorney and a sports coach amongst many others. The common denominator that Prasad points out in all these people is their ability to think out of the box and accomplish extraordinary things. A philanthropist and a social activist by profession, Nilekani has penned this book based on interactions between business magnates and social leaders. Based on a TV show which she hosted in 2008, the book explores 8 major themes of polarization between business and voluntary social sectors. Capturing rare conversations between industry giants, Nilekani helps her readers realize that social and corporate developments inadvertently go hand in hand. Co-written by MIT professors, Poor Economics answers questions of whether a billion hungry people really exist or not, why the poor who don’t have enough to eat end up buying a TV, how having more children directly relates to poverty and so on. 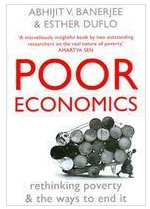 If you want to learn more about the economics of poverty, pick up this book which is also the winner of the 2011 Financial Times and Goldman Sachs Business Book of the Year Award. Although IIPM and its founders have undergone a lot of controversy for their institute offering MBAs, this book remained popular in 2011. With none less than SRK launching this book, the main theme is about the hard selling strategies of modern day marketing. 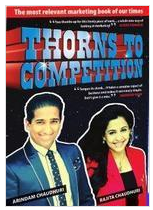 Formulating an acronym for THORN (Target It Right/ Hit Where It Hurts / Obsess With It / Reinvent It / Nail It / Sell It), the book pretty much maintains aggression in marketing as its central theme – sounds familiar to what IIPM is doing, isn’t it? Although this is not an Indian book, it has been a bestseller in India particularly because of the unfortunate death of Jobs, of course. Not much needs to be said about this book except that it is an absolutely stirring narrative of this creative genius. This book sold a little over 14,000 copies in its first week in India, compared with a massive 379,000 in the United States. Do you think we missed any that needed a place in Top 10 or do you have your own picks to share? Comments are Open! "Top 10 Indian bestselling business books of 2011! ", 5 out of 5 based on 1 ratings. I have read eight of these. I wrote reviews for some of these books. Read them and decide before you buy. seriously! how can u have thorns and steve jobs in the same list? Great books but i am looking for some books related to facility management as this is becoming a popular subject in emerging markets. I dont think Chetan Bhagat has written any book on business?